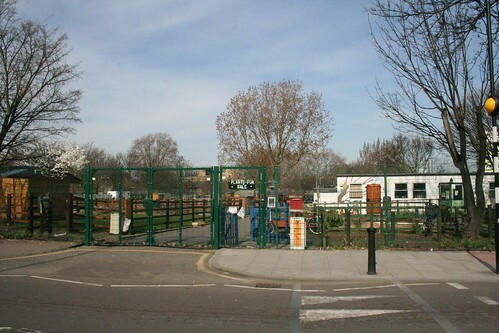 Nearly 30 years old, the Stepney City Farm, previously known as Stepping Stones Farm is based not that far from Spitalfields farm, but offers a very different experience. 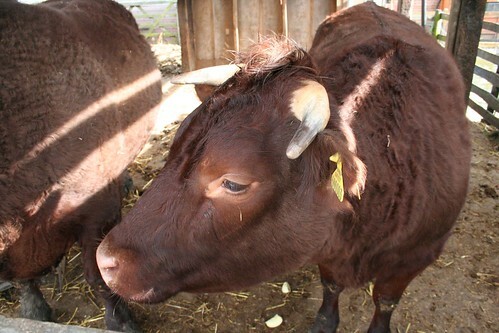 They very specially state that as a working farm, not a petting zoo, they breed animals for sale at market to breeders or for meat – which marks them out from some city farms which lean towards rare breeds or a more fluffy approach to the purpose of breeding animals. Some city farms are quite open to visitors, and some have high fences surrounding them. This is of the high-fence variety, and you have to negotiate a door to go inside the farm. A seating area and cafe and a wide central corridor greet you. To the right is the usual city farm supplies of smaller animals, ferrets, ducks and the like, while larger pasture areas stretch to the left, along with newish looking huts for some of the animals. An area looked like it was being set aside for allotments when I visited and indeed, there seemed to have been quite a bit of work carried out on the farm recently. A curiosity to the far end of the pasture area is the remains of an old stone building – an old church? For people living locally, this is going to be a good city farm to visit, with a good mix of larger animals – such as donkeys and cows, along with the children’s favourite of ducks and geese. Unlike most venues with ferrets that have large runs, and hence the ferrets tend to be asleep a lot, here they are in a “hutch” and seemed to be more curious and active than at other farms, although that could have been just a coincidence on my visit. 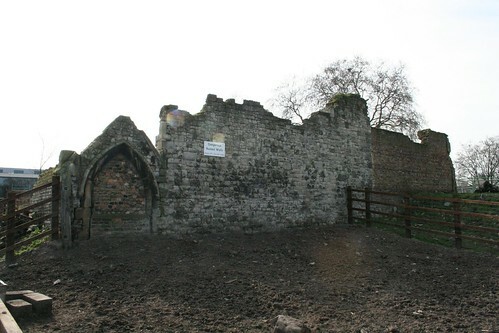 The old ruin is unusual, although as it is inside the pig enclosure you can’t get too close to it. Can be closed if there is a lack of volunteers. It is a short walk from the Regents Canal, and the Ragged School, a museum of a Victorian era school. Those are indeed the ruins of an old church, bombed out during the second world war I believe. There are older and more important historical ruins on the site too for people with an historical bent to investigate. The Farm has undergone dramatic change over the past two years I’ve visited and there have been many improvements to the structure of the site itself and it’s management in that time. There are also several new and some unique projects under way such as the Young Growers Club and the Rural Arts Centre, (where you can see and learn about green wood working, pottery/ceramics, and blacksmithing amongst other things). I used to go to this farm when i was a child back then it was run by a family and headed up by lynne (now decesed) she and her family run the farm as a petting zoo and to get inner city children to interact with the animals…. it certainly left a huge impression on me… and many others this place holds true and im soooo glad it is still here to assist and educate other children etc like it did me all them years ago… i still have memories of the sheep chasing us up the fields when we were shearing and the pigs attacking the brooms when i was cleaning them out, the cattle were really sweet and never really did anything there was rabbits and lots of other things to look at it was alot more interactive back then as there was not as much health and safety as there is now… also there was times i remember collecting the goats milk… lynne also cared for her husband who was terminally ill and as such she was a women of strength and a passion for animals that has inspired many people like myself that also made it in the animal world and work with animals now i keep in contact with most of them and now run my own equestian company producing dressage horses for the competition arenas of the uk and europe, it is really nice to see it all still going…. there was also a riding school next door called jimmys riding school where i got my serious horse passion from and still to this day i remember them all…. great times ….great memories!!!!!!!!!! !